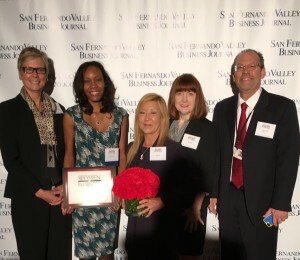 New Horizons is proud to recognize Chief Operating Officer Roschell Ashley for being honored by the San Fernando Valley Business Journal as a woman in business because of her outstanding achievements in the business community. 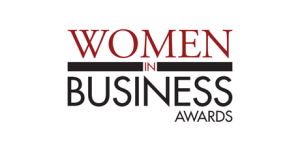 During the 15th Annual Women in Business Awards which took place on April 11, 2016 at the Universal Sheraton Hotel, Roschell Ashley was celebrated for her forward thinking initiatives which help to provide the best in job training and placement services, workshop, educational programs, and residential homes and support to more than 1,000 individuals with special needs we serve each year. In 2012 New Horizons bought a plot of land in Reseda in order to build a $1.2 million home for individuals with Down syndrome who develop Alzheimer’s. This project was made possible by a grant Ashley secured in order to begin building a six-bedroom group home for this purpose, making it the agency’s 13th group home and one of only a handful of such residences in California and nationwide. Her most recent accomplishments have included bringing the National Task Group on Intellectual Disabilities and Dementia Practices (a group born out of legislation signed by President Obama in 2011) to California. Through collaboration with this organization, Alzheimer’s Greater Los Angeles, and Cedars of Marin, Ashley co-created a training program for care providers and practitioners who care for individuals with Down syndrome who develop Alzheimer’s/Dementia. This curriculum has sense been used throughout the United States. In 2014 in collaboration with California State University Northridge (CSUN), Ashley came together with engineering students and business professionals from Technische Hochschule, a technology university in Germany associated with Audi and BMW, to discuss lean practices and “social sustainability” in business. And as a recognized expert in her field, she continues to be invited to sit on panels discussing housing and aging issues for individuals with special needs. Ashley has been a featured speaker at conferences throughout Los Angeles, including Bet Tzedek and most recently at CSUN’s annual the Art of Innovation Conference. For all she’s done, New Horizons honors Roschell Ashley, too. Mission: New Horizons 13th Annual Gala Fundraiser DOVIA-LA highlights one of our own!